It was the most ambitious highway project in the province’s history. It’s one of the most heavily travelled route in all of British Columbia. From top to bottom, motorists can experience every single type of weather condition known to man. With a summit reaching 1,244 metres tall (imagine almost 3 CN Towers stacked up), it isn’t uncommon for it to be snowing at the peak and sunny at the base. We’re talking, of course about the Coquihalla Highway. 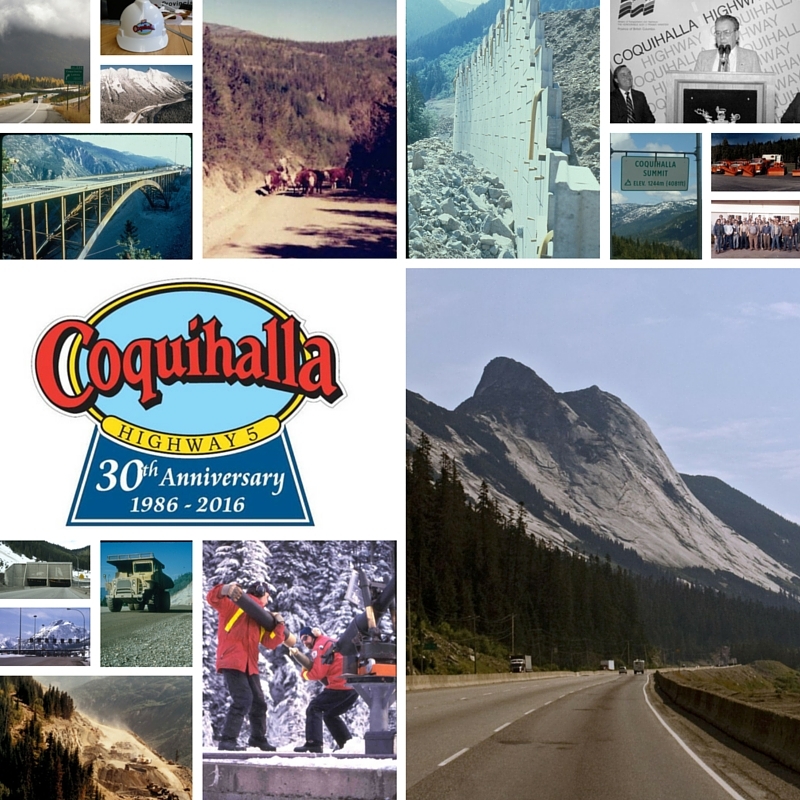 The Coquihalla turns 30 (!) this year and to celebrate, we’ve collected images, videos and stories recounting the amazing tale of its construction and the impact this famous route has had on our lives. Situated in southwestern BC, the Coquihalla (part of BC Highway 5) was completed in three phases. The first phase of construction, which officially opened on May 16, 1986, was the longest stretch at 120 kilometres. With the second and third phases, which linked Merritt to Kamloops and to Peachland respectively, overall travel time was significantly reduced, opening up a connection between major coastal communities and the interior of BC and providing a faster, safer alternative to the Trans-Canada Fraser Canyon route. Design of the Coquihalla Highway began with exploration of the proposed route in 1973, followed by an official survey in 1978 when the first construction contract was let. Accelerated design and construction began in the spring of 1984 in preparation for Expo 86 in Vancouver. To be sure the project was completed on time, more than 10,000 people were needed to fill all of the jobs. More than 1,000 pieces of heavy equipment worked non-stop every day during the summer of 1985 to get it done! The flat floor of the Boston Bar Creek valley was identified as a better route than following the Coquihalla River’s steep and narrow upper gorge; however this route also meant an increased risk from avalanches that had to be overcome. An incredible eight avalanche dams, 19 containment basins, two diversion trenches and three sets of avalanche benches were built in addition to the massive Great Bear Snowshed, to protect the highway. At 300 metres long, Great Bear is one of BC’s largest snow sheds, protecting the highway travellers from some of the province’s most active avalanche passes. 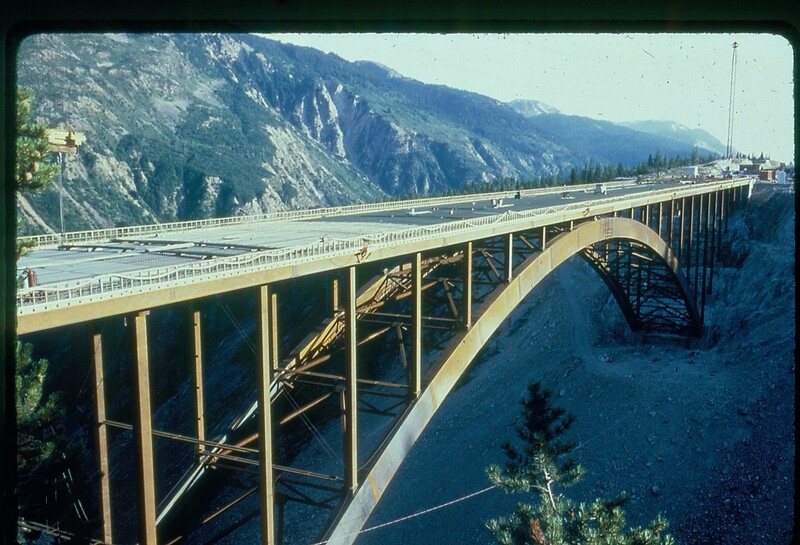 The Coquihalla Highway is also bridge engineer’s dream, with a bridge or overpass on average every 3,158 metres. The construction of the Coquihalla also included award-winning work to protect fauna and flora along the route. All environmental work was planned and performed under the supervision of environment and fishery experts. When the Coquihalla opened, it wasn’t just a faster route to the interior of the province; it also became a vital link between the community of Merritt and the rest of the province. For years leading up to the opening of the Coq, the community of Merritt had been lobbying the province to build a new route through the Coquihalla Pass to Hope, which was accessible only by cattle trails. Today Merritt is a vibrant and growing community, an important hub between the coast and the interior of the province. The City of Kamloops and the Okanagan have also experienced a tremendous amount of growth and change since the Phase 2 and 3 of the Coquihalla were completed, evolving into the bustling metropolitan hubs we know them as today. The Coquihalla corridor also plays a vital role in our Pacific Gateway strategy by supporting the fast and efficient movement of goods between BC, the rest of Canada and the rest of the world. Nine million tonnes of gravel (625,000 dump truck loads) were hauled. 45 kilometres of culvert pipe were installed. 700,000 loads of dirt were hauled. 160,000 tonnes of concrete were poured. 26,000 tonnes of steel were installed. 90,000 metres of fencing were installed. 150,000 metres of median and guard rail were installed. 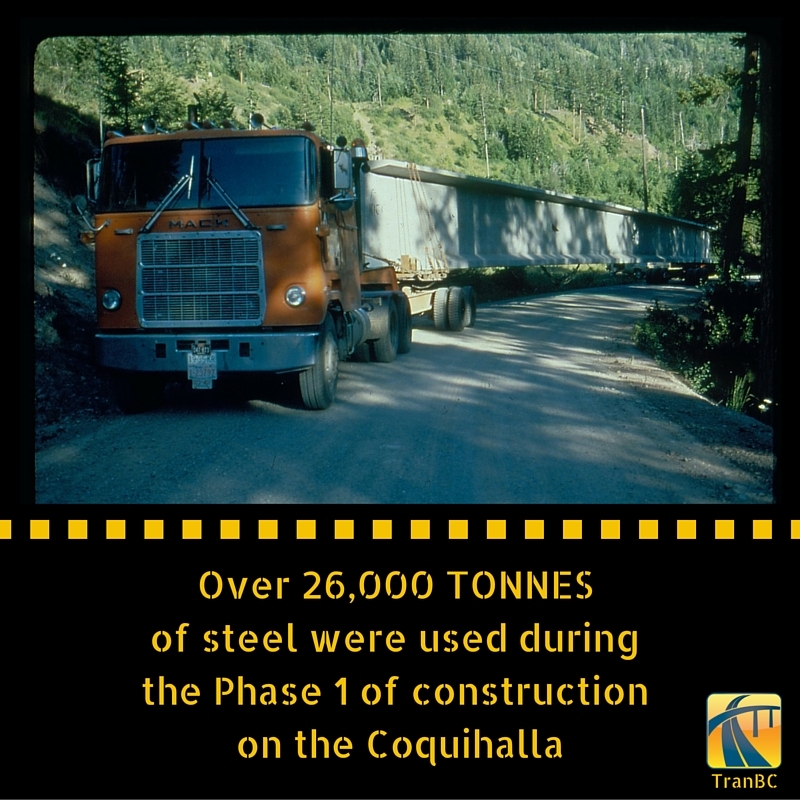 Stay tuned as we shared more stories, images and videos celebrating the Coquihalla. If you have a question or comment about this or any of the other work we do, let us know in the comments below. TranBC Trivia: Do you remember this bumper sticker? Two versions of the sticker were made and handed out to travellers passing through the toll booths during the first year the Coquihalla was open. One read “I Drove the Coquihalla” and the other “I Drove the Coquihalla on Opening Day”. I understand that the caribou have migratory routes that traverse the area where the Coquihalla was built and that tunnels were built specifically for animal migration. Is that true and do you have any documentation resources about how environment and biodiversity preservation were considered? Any people who remember these considerations? 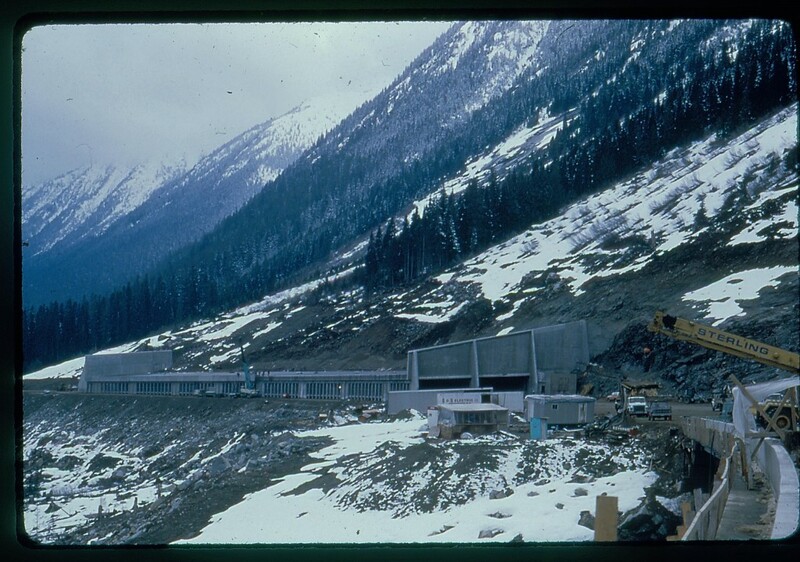 The Coquihalla project was groundbreaking in many ways and environmental work was one of those areas. This video explains how wildlife fencing and underpasses were constructed as a part of the project to help moose and deer move freely without having to engage with traffic. We don’t have too many folks left from the days of the construction, but we have forwarded your question to our Environmental Management group, who are responsible for managing the safety of wildlife along BC highways. Myself, Ross Coulter and Bill Kobenter worked in the Design & Surveys Department. We researched and maintained the geometric design standards that all engineers and civil technicians used for the production and design of this magnificent feat of engineering. I’ve worked on the 144″ water pipeline in Libya, Bay Area Rapid Transit extension and the China Town extension for San Francisco Muni and none of then presented the technical difficulties that the Coquahalla did. Kudos to all my coworkers for doing the impossible. Thanks for sharing this with us Paul – we love hearing these stories from the men and women who played such an important role in helping build our province! Thank you Paul! I am Bill Kobenter’s son. My father was a very dedicated member of Highways going back to the WAC era. He always prided himself in working with a dedicated team of knowledgeable and skilled co-workers. He, like many, believed passionately in the domain, the discipline and the work. Reading your comments brought back a smile and many memories, such as the time there was a competition to design a new logo for Highways and my fathers contribution (which years later looked similar to the ICBC logo!). Once again thank you! Thanks you so much for the page you have put together. My uncle, that has since passed away, was one of the superintendent of the jobs and I remember seeing a old 8 mm video of him flying over the route in a helicopter. And pictures he took as the project went on as he loved his camera. I was lucky enough to even been able to travel the highway before it was open and remember how strange it was with know other cars around. I agree the toll booths should have remained open to cover maintainace costs .i am curious to know how long it took for construction of the connector hwy 97 c . It opened well after the coquihalla , but when did construction begin ? Just worked out that if the Coquihalla had been built at the same rate as the Trans-Canada is being 4 laned (less than 4 km per annum since 2001) the FIRST phase would have opened in 2008. In the Alps, a vast region that has been travelled for many centuries, all roads, including the latest freeways, avoid high plateau regions. These roads are designed to follow valleys, even if it means digging expensive tunnels in narrow valleys and under passes. For two excellent reasons: to avoid high altitude weather and to stay close to services. Valleys are lived in, so service stations and emergency services are never far away. That has a spin-off effect as well (hotels, restaurants, motor services) in regions that need a steady influx of money for long term sustainability. These factors were disregarded when the Coquihalla and the 97 connectors were built. Thanks for connecting with us here. The majority of BC’s highways follow valley routes for the same reasons you mentioned above. The Coquihalla was constructed to save travel time by providing a more direct route to the interior of the province. Its midway point (Merritt BC) has a variety of commercial and emergency services as well. That being said, BC Highway 1 and 3 are still available for travellers who wish to take the lower, slower route. Hope that this helps! I took the Coquihalla highway after it opened on my way to Expo 86. I got one of the bumper stickers. “I Drove the Coquihalla”, which I still have. Good article, some interesting facts. Thanks for your feedback Bryan and remember to keep that bumper sticker – they’re a collectible now! I am curious about the statement that it’s the most heavily travelled route in BC. According to your figures the Malahat has a higher daily volume but if that doesn’t count because it’s on the Island, then surely Highway 1 through Coquitlam Burnaby and Vancouver sees more traffic? Thanks for connecting with us and for the great catch. This should read “one of the most heavily travelled routes”. Are you looking for the names of specific contractors used during construction? I think it was a mistake to remove the toll booths, since the revenue $100 million or more per year, could be used to improve other routes -as mentioned by other commenters. Also since it seems half the traffic is from Alberta, it was a method by which they could contribute to both the construction and ongoing improvement and maintenance costs. One sorely needed improvement is an eastbound off-ramp onto 97C near Merritt. Traffic now has to slow right down for a 180 turn, and often as not stop at traffic lights leading to visitor centre! Then turn left and grind up a major grade. Inconvenient for passenger cars but a huge time and fuel waster for transport trucks. With a proper off ramp much of the vehicle momentum would be preserved for the uphill grade. Thanks for your comments. We have shared them forward with the local area manager for review. Shame the traffic to the rest of Canada then has to negotiate a 55 year old, 2 lane, winding accident and closure prone bottleneck. Despite the ‘aim’ to 4 lane from Kamloops to the Alberta Border and Christy Clark’s promise of $650 m over 10 years, at the current rate of progress they will still be doing so in 30 years from now (and for some considerable time after that).